The government reported seven deaths in the Nord-Ouest province and four other deaths in the community of Gros-Morne in the province of Artibonite. The U.S. Geological Survey says a 5.2 magnitude aftershock has rattled northern Haiti, a day after a 5.9 magnitude earthquake left at least 12 dead and 188 injured at the same location. The USGS says the aftershock’s epicenter was located 15.8 kilometers (9.8 miles) north-northwest of Port-de-Paix, and had a depth of 10 kilometers. It struck at about 3 p.m. local time on Sunday. “It was an aftershock. It was at the same location,” said Paul Caruso, a geophysicist with the USGS. “This is the first significant aftershock”. At the time, emergency teams were bringing relief to victims of Saturday’s quake, which toppled cinderblock homes and rickety buildings. Authorities said at least 12 people died and 188 were injured. Haiti’s civil protection agency issued a statement saying that houses were destroyed in cities of Port-de-Paix, Gros-Morne, Chansolme and Turtle Island by Saturday’s temblor. A magnitude 5.9 earthquake in northern Haiti has killed at least 11 people and injured others. 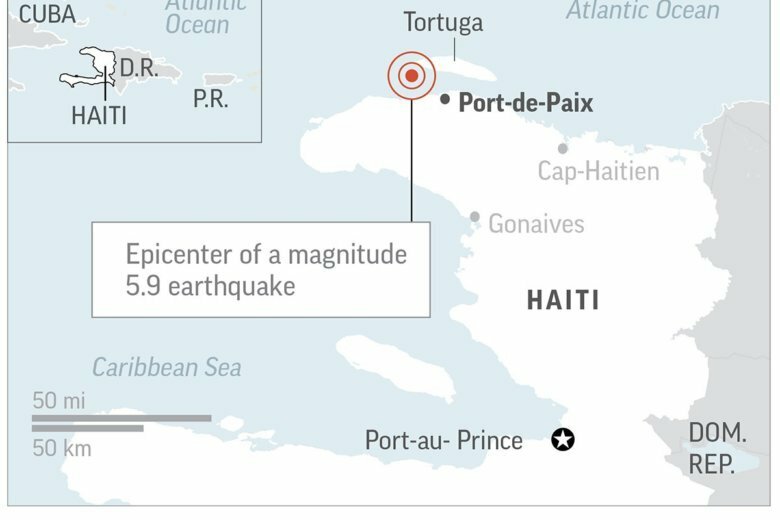 The U.S. Geological Survey said the quake hit at 8:11 p.m. Saturday night (001 GMT) and was centered 12 miles (19 kilometers) northwest of Port-de-Paix, which is about 136 miles (219 kilometers) from the capital of Port-au-Prince. The quake was 7.3 miles (11.7 kilometers) below the surface. The country’s civil protection agency issued a statement saying several people were injured and some houses were destroyed in Port-de-Paix, Gros Morne, Chansolme and Turtle Island. Among the structures damaged was the Saint-Michel church in Plaisance. In 2010, a vastly larger magnitude 7.1 quake damaged much of the capital and killed an estimated 300,000 people.